Our B-Fresh Oxnard location has been a leading grower and shipper for over 25 years. It is well-situated just a mile from the Pacific Ocean and has a state of the art facility that includes greenhouses, open field cultivation, a bouquet production room, coolers, staging areas, and dry and wet packing. We pride ourselves in using sustainable techniques and the steady ocean breezes promote a moderate year-round climate, ideal for growing the healthiest, most colorful flowers. 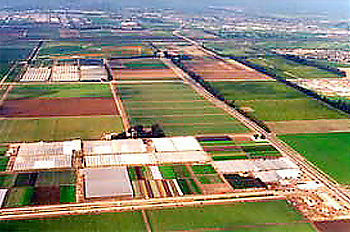 We are proud of our staff of 100 plus employees at our Oxnard location along with our 20 acres of environmentally-controlled Greenhouses, 25 acres of hoops and 25 acres of open fields to constantly ensure the top quality and performance you demand of our products. We grow over 35 different types of flowers that include over 100 different varieties.